‘… And what wonderful, idiomatic gems he provides for us (with tongue firmly in cheek) under topic headings such as ‘A Little Trip to Paris,’ ‘More Table Talk,’ ‘Useful Tips’ (some good grammatical points), Two Wonderful Verbs (faire and porter). … The phrases ring constantly true. … The section on motoring in 1927 is not just of historical interest, several of the phrases would have come in very handy recently when I was in South-West France. … Our Language Library shelves at Oxford are stacked high with textbooks which meet the criteria for being notional-functional, communicative, or content-based, which are full of worthy tasks, pair and group work suggestions, practical vocabulary for doing and saying things, exercises and more exercises. But few courses these days have what might be called intrinsically interesting or amusing content which might engage learners in any real sense of the word. H-T-R- is attempting to genuinely engage his learners. When did readers last read a really good dialogue in a language textbook with a real sense of conversation and a good punchline? For those with faltering school French, these books provide a breath of fresh air, quite a few laughs and some really useful idiomatic French …’ [—Elsevier SYSTEM Journal —International Journal of Educational Technology and Applied Linguistics, 2010]. ‘…Great Fun.’ —Books Ireland (2010). ‘…that brilliant anonymous volume Brighter French reveals very clearly the idiomatic raciness of the French language and the essential humanity of those who speak it.’ —N. Scarlyn Wilson, in the Preface to Teach Yourself French (in its 36th impression 1980)]. ‘…when you start to read, you giggle. This naughty guide to flappers' French is full of useful phrases. … This is your ticket to gay Paree.’ —Evening Herald (2011). ‘one of the best French language books ever written.’ —Wiltshire Times (2010). ‘One's only fear is that a complete absorption of its contents might result in the "Bright Young People (who already know some)" knowing a trifle too much!’ —John o'London's Weekly (1927). 1. "What did he die of ?" "Nobody knows. But then nobody knew what he lived on, either." 1. « De quoi est-il mort ? 53. "One moment, Monsieur … I can't see you. I'm in my chemise." "Take your time, my dear, I'll wait till you take it off." 53. « Un instant, Monsieur… je ne peux pas vous recevoir. Je suis en chemise. 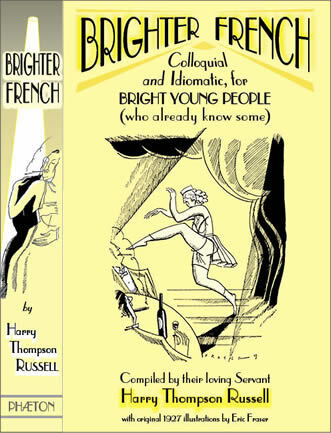 Fully revised and extended edition, noting French Spelling Reform of 1990 etc., with new biographies (including 28 photos) of the author, Harry Thompson RUSSELL, and of the illustrator, Eric FRASER. Contains all of the original drawings, plus many new drawings, by Fraser, one of the leading illustrators of the 20th Century.